A worldview is basically a framework of ideas and attitudes that influence our personal philosophy. Our worldview is shaped by our education, our upbringing, the culture we live in, the books we read, the media and movies we watch, etc. Worldviews provide answers to life’s ultimate questions and are profoundly theological, even for the atheist. 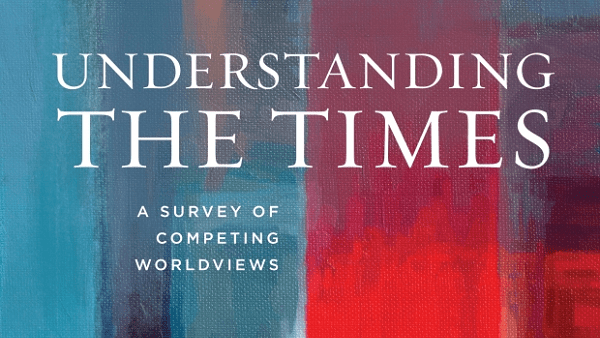 Understanding the Times from Summit Ministries is a guided study of worldviews, designed to help students look more deeply at the ideas that run the world around them. Summit Ministries has a goal to teach both young people and adults to first understand their Christian worldview, and then to understand the way other people see the world, so that they can compassionately and intelligently engage the culture. Understanding the Times examines the six most prominent worldviews influencing the world today (Christianity, Islam, Secular Humanism, Marxism, New Age, and Postmodernism), and it shows how their influence manifests in the key academic disciplines operating in America’s institutions of higher learning (Theology, Philosophy, Ethics, Biology, Psychology, Sociology, Law, Politics, Economics and History). The curriculum is available in a hardcover text, Kindle ebook, and an online digital format complete with day-to-day lesson plans, projects, resources, quizzes, and more. Some of the issues covered include: abortion, apologetics, the arts, biotechnology, critical thinking, cults, euthanasia, leadership, radical environmentalism, radical feminism, the problem of evil, religious pluralism, scriptural reliability, and more. When students finish this course they will better understand the culture and times they live in, be better prepared to identify different worldviews, and have more fully developed their own worldview. Designed to be used as either a one- or two-semester course for high school students in the 12th grade, the Understanding the Times high school curriculum by SummitU offers a sequential, discussion-based series of compelling and helpful ways of thinking about the world. The student price for a digital subscription is $29.99. Each student license comes with a digital textbook. However, some people still prefer physical books. A hard copy of the student text may purchased at Amazon to accompany the digital curriculum or to read on your own. For Single-Family Use: Pick the Homeschool Version. The material is the same for the teacher in both the Christian school and homeschool versions, but the school administrative set-up process is bypassed for homeschool use; just add your students and begin! For Homeschool Co-ops: If you are part of a co-op with a more traditional-school layout (i.e., one teacher overseeing the course and 3+ students in attendance), multiple class sections, or 2+ class times per week, then the Christian School Version will serve you best. Each course comes pre-populated with a Weekly Syllabus. All assignments are distributed per week and intended to be completed by the student for the following week’s class period, when a test will be taken, assignments collected, and the next week’s coursework distributed. As always, the parent/teacher has full ability to rearrange, remove, or add assignments to the syllabus. This book by Dr. Jeff Myers and David A. Noebel is the landmark guide to understanding the ideas that rule our world. There is a lot of material to be covered, but it’s presented in a systematic way and described in an engaging, easy-to-understand writing style. This classic should be on the bookshelf of every Christian home, on the desk of every Christian pastor, and in the hands of every Christian student headed off to college. Does the Bible have authority in a world committed to relative truth? The understanding of absolute, objective truth has been largely lost. Spend just a few minutes discussing politics or religion and you’ll hear responses like, “There is no truth!” or “That may be true for you, but not for me.” Understanding the Faith dares to wade into the middle of the controversy with chapters such as: Is God Christian? Is Claiming Truth Intolerant? Is the Bible Anti-Science? This capstone book to a groundbreaking worldview trilogy equips readers to apply a bold Christian witness to their relationships with loved ones, neighbors, and colleagues. Addressing issues such as gender identity, abortion, technology, and poverty, Dr. Myers first shows readers what they can learn from Christian history—and why today’s issues might not be as new as they seem. It’s a must-have resource for every Christian’s bookshelf. Students who complete the 36-week syllabus of either Understanding the Times or Understanding the Faith through SummitU can earn 3 hours of college credit. These credits are offered through Bryan College, a Christian liberal arts college in Dayton, TN. Since Bryan College is fully accredited by the Commission on Colleges of the Southern Association of Colleges and Schools, credits easily transfer to most schools (both religious and secular). Since each institution is the sole determiner of credit acceptance, it is recommended that you check with your chosen college before applying.